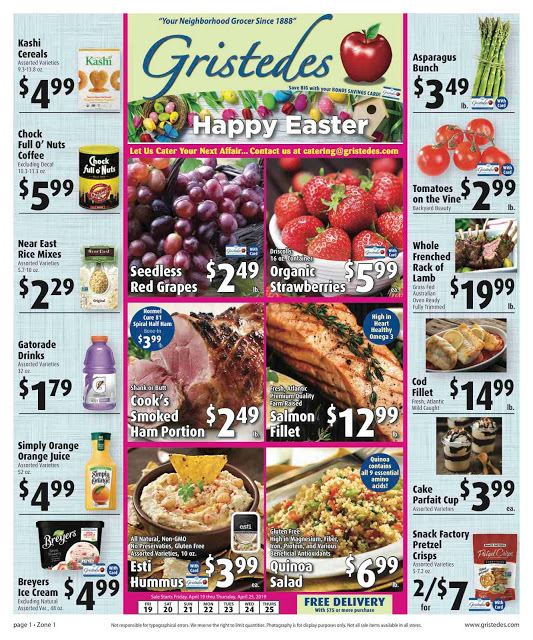 in Long Island City right across from Costco at Vernon B'lvd and 33rd Street. 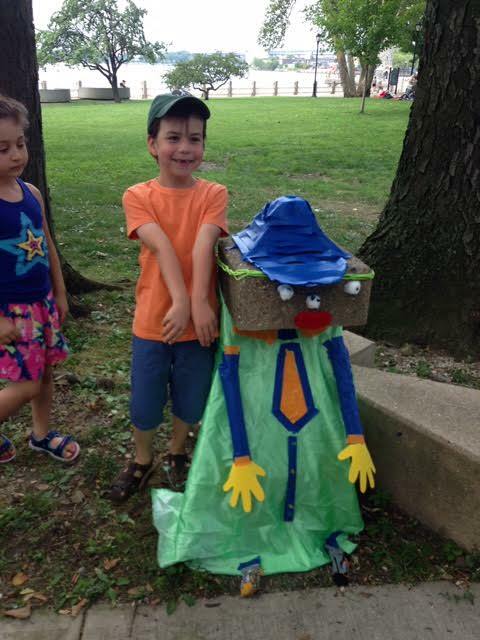 This Sunday, friends and neighbors are invited to visit the Museum for free and participate in a variety of programs. From 11:00am-2:00pm, families with children between the ages of 2 and 12 are encouraged to join us for Open Studio. This month, kids and caregivers will spend time in the Museum's galleries looking at the different ways Noguchi combined two-dimensional shapes to create three-dimensional forms and then collaboratively create a large sculpture inspired by their experiences. 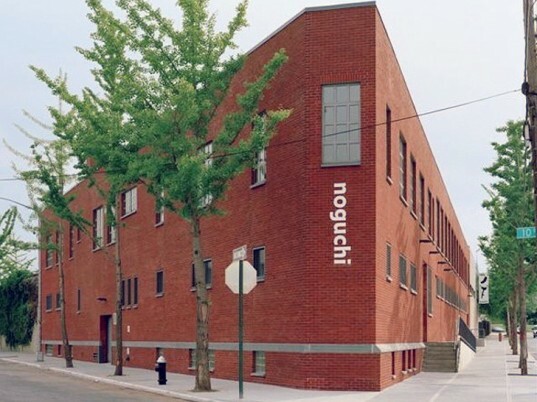 At 2:00pm, visitors of all ages can learn more about Noguchi's life and see highlights from the collection during this informal and interactive gallery tour. During this hour-long program, which will take place at 4:00pm this Sunday, adults explore and discuss a single work of art in the Museum's galleries. For more information on the Museum's exhibitions and programs, please click here. If you go, check out the nearby Socrates Sculpture Park too. There will be Hip to Hip Theater performance of Shakespeare's Merry Wives Of Windsor. 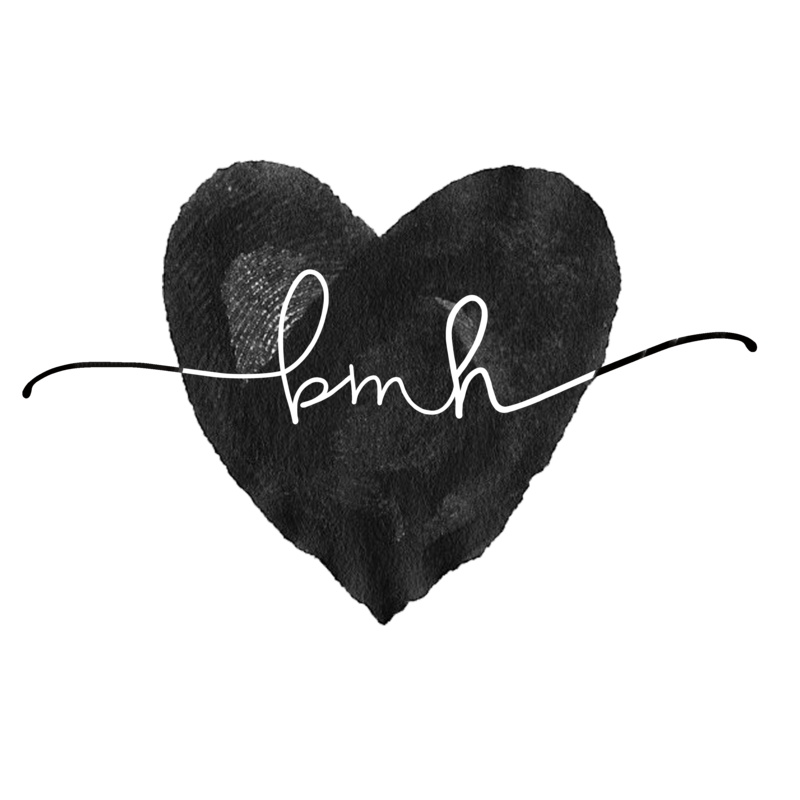 Click on the full screen icon, bottom right corner, to get full effect. 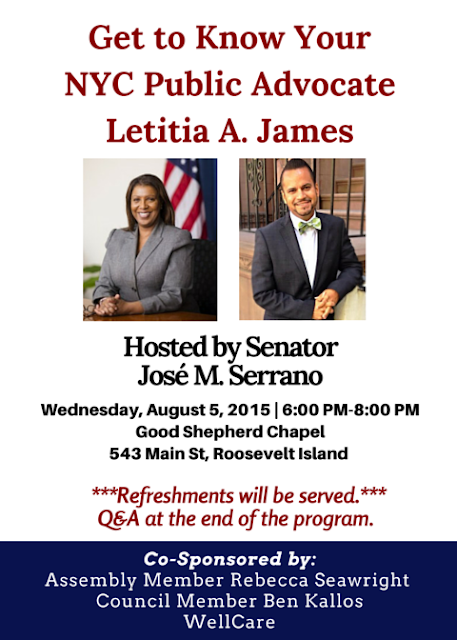 NYC Public Advocate Letitia James will be holding a Roosevelt Island Town Hall Meeting hosted by NY State Senator Jose Serrano 6- 8 PM Wednesday August 5 at Good Shepherd Community Center. The Office of Public Advocate for the City of New York is a citywide elected position in New York City, which is first in line to succeed the Mayor. The office serves as a direct link between the electorate and city government, effectively acting as an ombudsman, or "watchdog," for New Yorkers by providing oversight for city agencies, investigating citizens' complaints about city services and making proposals to address perceived shortcomings or failures of those services. Public Advocate James is a non-voting member of the New York City Council with the right to introduce and co-sponsor legislation. Public Advocate James is also charged with appointing members to various boards and commissions, including one member of the New York City Planning Commission. Public Advocate James serves on the committee which selects the director of the Independent Budget Office. These duties are laid out in Section 24 of the City Charter. Bring your questions and concerns to the NYC Public Advocate's attention at the August 5 Roosevelt Island Town Hall Meeting. Roosevelt Island Residents Association (RIRA) Government Relations Committee Chair Joyce Short shares this list of concerns. The unreasonable expectation that RIOC should charge high fees to the non-profit organizations that support the quality of life in our community. The negative impact of RIOC's policies to charge the community for the use of recreational fields, prohibiting our children from the use of our fields in favor of the paying permit holders. Failure of Westview and Island House's landlord (Hishchorn) to disclose the actual costs that will fall on the resident's shoulders if their buildings are converted without performing the energy upgrades to convert to submetering. Greatly increased revenues to NYC as a result of the creation of Cornell-Tech with absolutely NO contribution pay-back to the community, by the City. The State of NY floated a bond issue to develop Roosevelt Island as a low and middle income community. But the conversion of the last two Mitchel Lama properties eliminates all subsidized housing stock in the community. What can your office do to insure that the residents receive the best protections for affordability? Roosevelt Island is a community in excess of 14,000 people who are governed by a Public Benefit Corporaton, not by elected government. RIOC is comprised of board members who are appointed by the Governor. Even though we have nominated people to serve on the board, Governor Cuomo has ignored those recommendations and has allowed the seats to expire. Just as all residents are entitled to democracy throughout our country, we residents of Roosevelt Island are entitled to democracy here on Roosevelt Island. 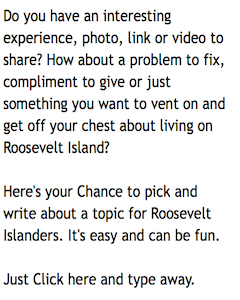 What can you do to bring a democratic process of government to Roosevelt Island? which is very slippery when wet. This issue has been known by DOT since at least 2011. Ms. James was the guest on July 2 episode of CB 8 Speaks discussing issues concerning the Upper East Side and Roosevelt Island. Here's what she had to say. What would you like to ask Ms. James? 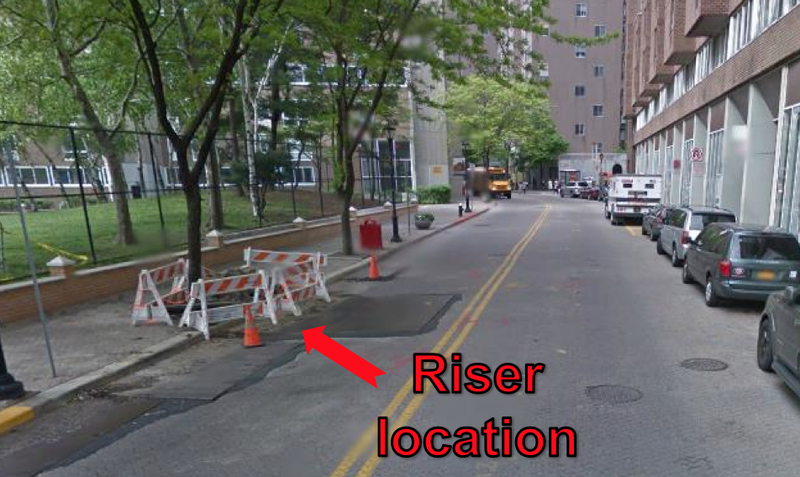 As previously reported, Con Ed will soon begin removing the aging Roosevelt Island gas lines beneath Main Street and replacing them with High Pressure Gas Lines. At the same time, Roosevelt Landings, Island House and Westview will be doing building facade work. The combination of Con Ed Gas line upgrade, building facade work and Cornell Tech construction deliveries will make for a great deal of disruptions on Main Street. Last Thursday, July 23, Con Edison representatives spoke to approximately 20 Roosevelt Island residents about the upcoming High Pressure Gas Upgrade. Con Ed Director of Manhattan Public Affairs Caroline Kretz promised to keep disruptions to a minimum and added that Roosevelt Island residents have no better advocates than RIOC. * For the first five days, crews will be working from 9AM to 2:30PM. Schedule is subject to change. We will notify the community of any changes. 1. Riser replacement work will start in late July and is estimated to be completed by Fall 2015. 2. Gas main work will start in early August in front of the FDNY building and move south. 3. Work will be performed around planned school activities. 4. Work will resume from the south in front of Blackwell House and move north towards the risers. This is estimated to be completed by Winter 2015. Next Spring, we will be back to tie the new gas facilities in. Here's video of the July 23 Roosevelt Island Con Ed Gas Upgrade Town Hall Meeting. Part 1 - Ms. Kretz introduced the presentation and gave an overview. Part 2 - Con Ed Gas Engineering rep Tom Femia, Construction Manager Michael Lombardi and Energy Services Manager John Romano described the project. Mr Femia reports that Con Ed will replace gas line coming from Queens, add a second gas line from Manhattan and upgrade 3 thousand feet of gas pipes underneath Main Street. Part 3 -Mr Romano talked about the schedule of work asserting that the gas upgrade work had to be completed by October 2015. 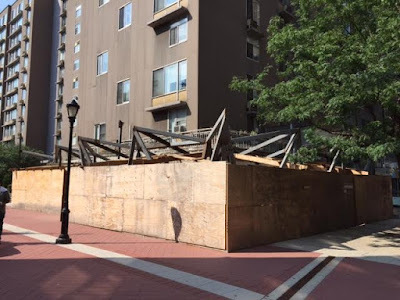 Several residents were skeptical that the October deadline was necessary and worried that the gas line upgrade schedule combined with the building facade work and other construction would cause unnecessary disruptions for the Roosevelt Island community. Mr Romano said that multiple Roosevelt Island customers were seeking the gas upgrade but other than the Octagon building, declined to name those customers. Part 4 - RIOC Director Michael Shinozaki was in the audience and summarized the project. Part 5 - Con Ed reps answered questions about safety, air quality and employee parking issues due to the gas line upgrade construction work. Also, methods for future communications with the community. Here's the Con Ed Roosevelt Island High Pressure Gas Upgrade Power Point presentation. The Roosevelt Island Con Ed High Pressure Gas upgrade will not begin until permit is issued by RIOC. 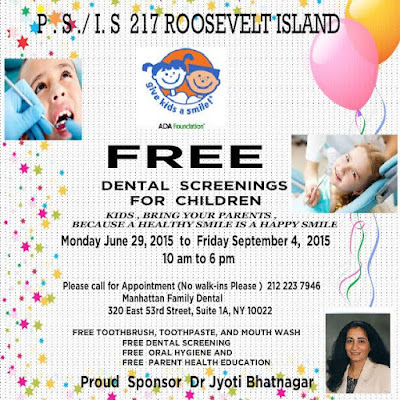 Roosevelt Island resident and dentist Dr Jyoti Bhatnagar is offering free dental screenings thru September 4 for Roosevelt Island children attending PS/IS 217. 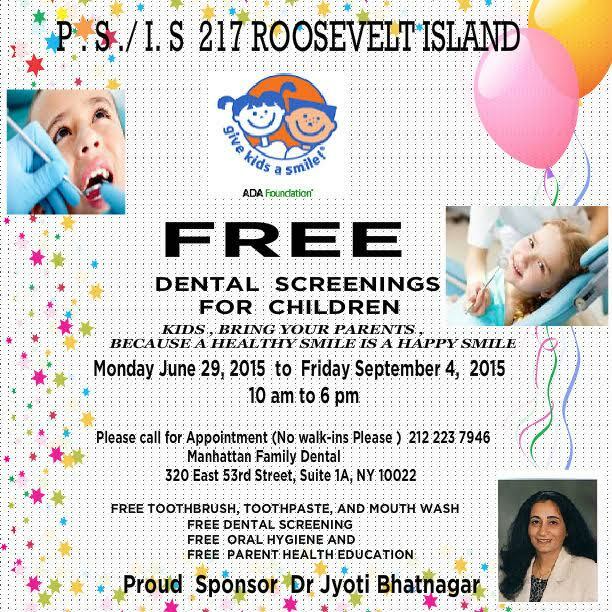 Dr Bhatnagar asks those interested to call for more information and an appointment (212) 223 7946. 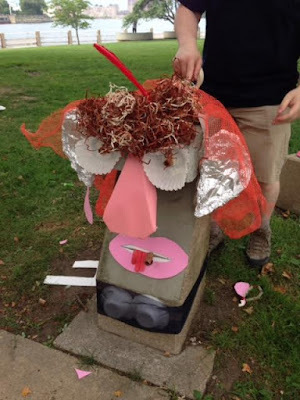 Roosevelt Island Explorers Awaken Silent Concrete Mini Men Between Coler Hospital And Lighthouse Park - What Hidden Roosevelt Island Gem Will They Transform Next? Roosevelt Island Explorers continue rediscovery of Roosevelt Island’s somewhat ignored spots, demonstrating endless possibilities for meaningful, creative, and fun engagement with our neighbors and the Island’s unique environment. 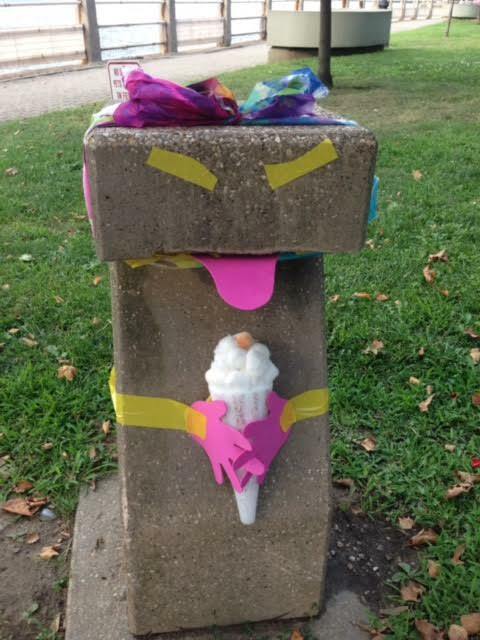 We met on Sunday, July 26, at the North tip to “awake” the silent concrete posts, which separate the hospital grounds from the park. Following this bonding experience, we agreed this was more than just FUN – the little concrete mini-men sprang to life filling this Island spot with energy and excitement. A brief shower only added more drama. We thoroughly enjoyed it and left assured that our Island “hides” multiple other spots to be discovered – what a beautiful place we live in! More information on the Roosevelt Island Explorers at their Facebook Page and web site. 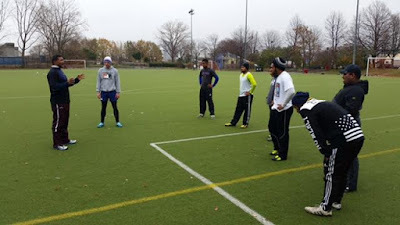 The Roosevelt Island Youth Program (RIYP) will launch a free co-ed introduction to rugby coaching clinic for middle to high school age children on the island starting on Saturday, 1 August 2015. The clinics will also extend to conditioning and coaching for all ages. 4:30 pm to 5:30 pm: Introduction to rugby for middle to high school age children. 5:30 pm to 7:30 pm: Rugby conditioning and coaching for all ages (Touch Rugby). and members of the Pacific Island Warriors (NY) Rugby team. Coach Vili has been affiliated with New York club rugby for 15 years after playing senior representative rugby in Fiji and the Pacific. Two of his sons are currently on scholarships playing Division 1 college rugby. They, along with rugby playing Roosevelt Island residents, will form the core volunteer coaching staff at the clinics. This community initiative comes from the growing interest in the United States in rugby both as a recreational and professional sport. Rugby is the national sport of many Pacific island countries. 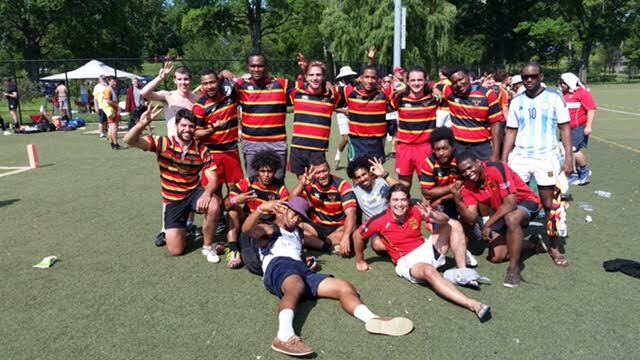 Over the last twenty years, Roosevelt Island has been home to many Pacific Islanders, who see this as a unique opportunity to give back to our host community by sharing their passion for rugby. Bring the kids out for an introduction to one of the fastest growing sports in the United States or simply join us for a run! The US national rugby team, the Eagles, will be playing in the Rugby World Cup in September 2015 and at the 2016 Summer Olympics. Rugby is also played at the high school and collegiate levels in the US. 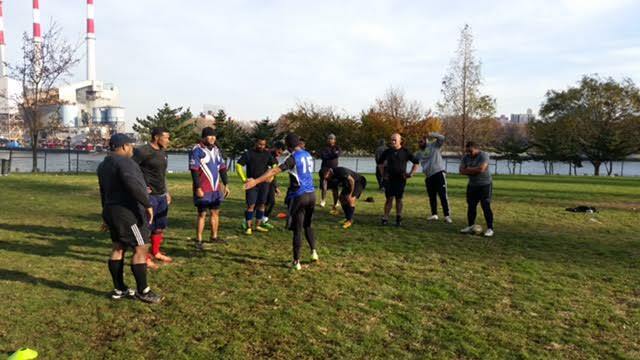 I am excited about the rugby program as previous attempts to introduce rugby on Roosevelt Island did not pan out. This rugby clinic is built on the commitment of volunteer parents and families who want to give back to their community through a sport that they know. It's a great opportunity for the kids to learn a new sport and make new friends." Here's a sample of Pacific Island Warriors rugby from their Facebook page. UPDATE 7/28 - Contact info if you want to play Bubbleball Soccer. 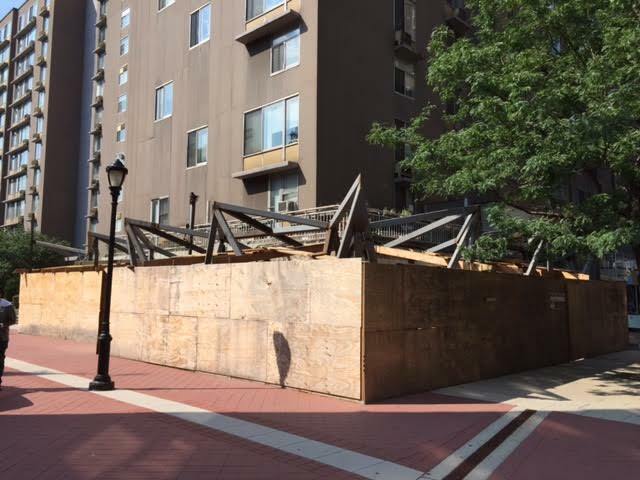 An update on Roosevelt Island Main Street retail. 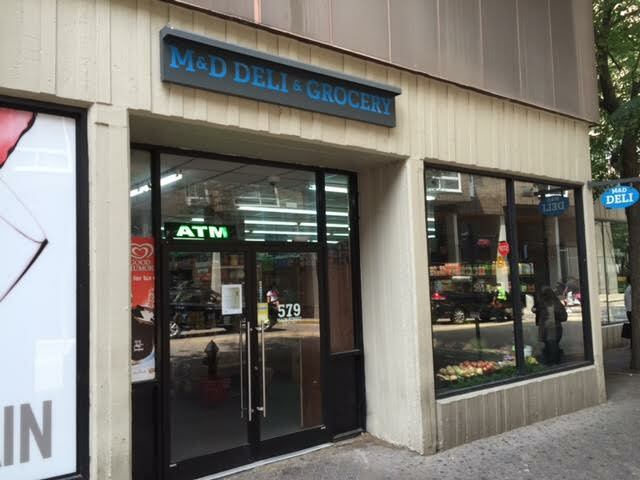 Have you noticed improvements at the Roosevelt Island M&D Deli? I am very pleased with Island Wines and Spirits. The store has a wide selection of delicious wines from various regions at reasonable prices, so that it's possible to buy a bottle on the spur of the moment to enhance dinner -- or to order several bottles or a case to have your own wine "cellar" at home. 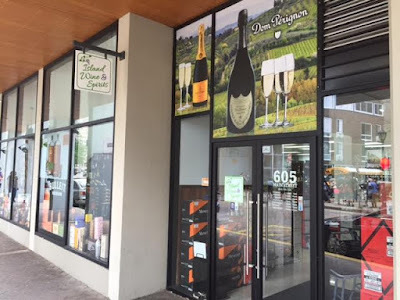 I usually find something to complain about when it comes to Roosevelt Island retail, such as it is, but the new wine store is the best store we've ever had. I urge other RI-ers support this nice store. 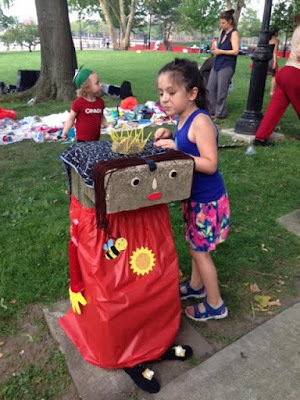 The summer is in full swing and we hope you can join us for the next free event in the "Crafts with Kids" series by the Roosevelt Island Parents' Network! 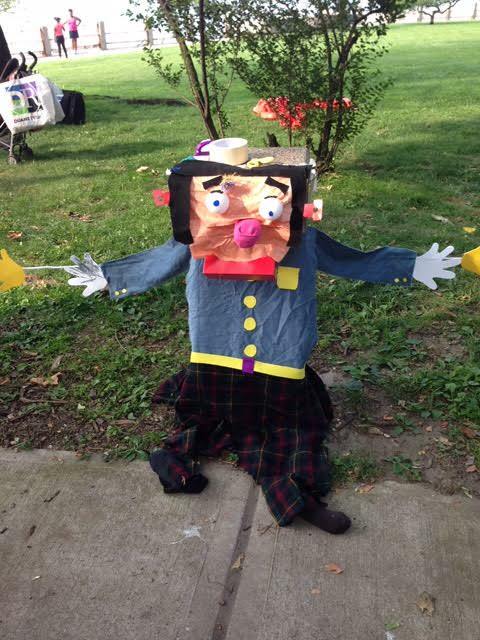 Our Summer craft will take place on Friday, August 7, at the Senior Center, 546 Main Street, 5-6pm. 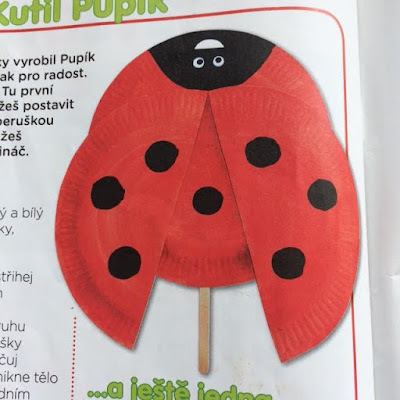 The children will be painting with red water colors on paper plates, adding dots and eyes later and creating a cheerful ladybug that they can either hang up on the wall or stick into a flower pot at home. While we will wait for the red layer to dry before painting the black dots there will be plenty of time for some summer themed story-time. 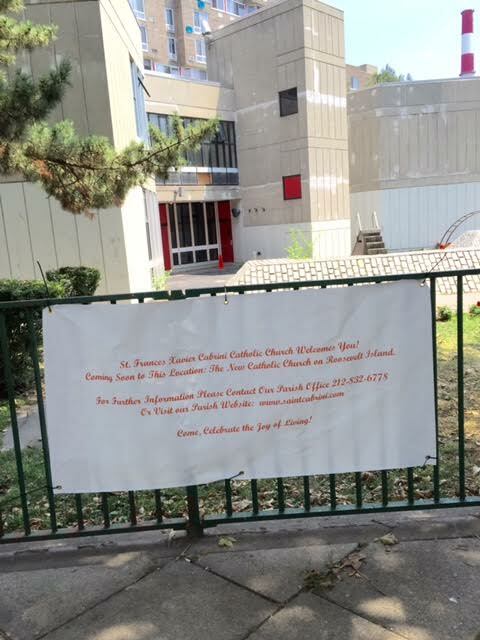 A special thank you goes to HOPE RI Church for contributing to the event supplies and to Dolores Green, Barbara Parker, Wendy Hersh and Marylin Atkins from the Senior Center for letting us use their space for the event. can/cannot bring own water colors (or tube of red color, red finger paint etc. ), brushes, and glue. can/cannot bring some summer or bugs related books for the story time or for our little kids book shelf during the event. 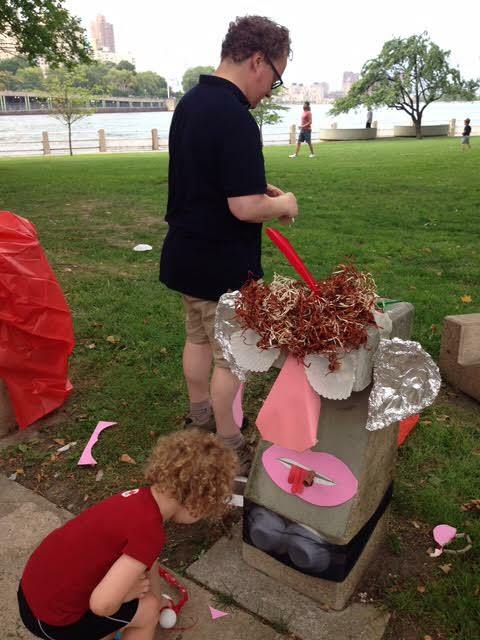 "Crafts with Kids" is a free workshop series for children organized by the Roosevelt Island Parents' Network. 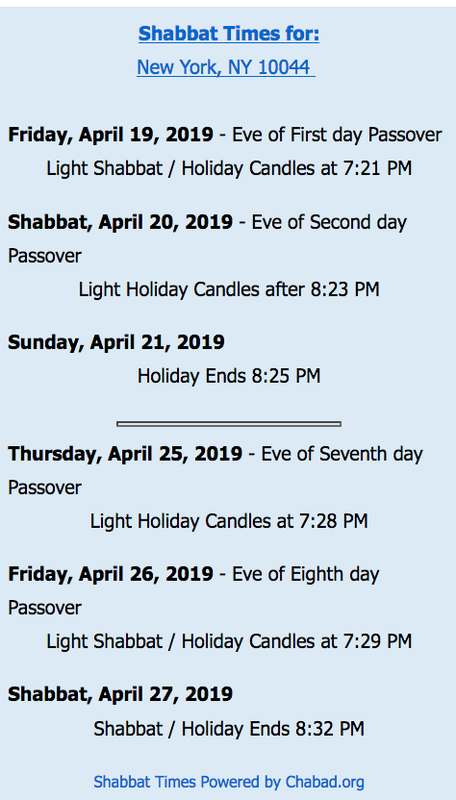 The monthly events included "Tram art and necklaces", "Matisse for Kids", "Valentines Craft", "St Patricks Craft", "Earth Day Craft", "Easter Craft", "Mothers Day Craft" and "Fathers Day Craft".